What Is Climate and Climate Change? Our weather is always changing and now scientists are discovering that our climate does not stay the same either. Climate, the average weather over a period of many years, differs in regions of the world that receive different amounts of sunlight and have different geographic factors, such as proximity to oceans and altitude. Climates will change if the factors that influence them fluctuate. To change climate on a global scale, either the amount of heat that is let into the system changes, or the amount of heat that is let out of the system changes. For instance, warming climates are either due to increased heat let into the Earth or a decrease in the amount of heat that is let out of the atmosphere. The heat that enters into the Earth system comes from the Sun. Sunlight travels through space and our atmosphere, heating up the land surface and the oceans. The warmed Earth then releases heat back into the atmosphere. However, the amount of sunlight let into the system is not always the same. Changes in Earth’s orbit over thousands of years and changes in the Sun’s intensity affect the amount of solar energy that reaches the Earth. Heat exits the Earth system as the Earth’s surface, warmed by solar energy, radiates heat away. However, certain gases in our atmosphere, called greenhouse gases, allow the lower atmosphere to absorb the heat radiated from the Earth’s surface, trapping heat within the Earth system. Greenhouse gases, such as water vapor, carbon dioxide, methane and nitrous oxide, are an important part of our atmosphere because they keep Earth from becoming an icy sphere with surface temperatures of about 0°F. However, over the past century or so the amounts of greenhouse gases within our atmosphere have been increasing rapidly, mainly due to the burning of fossil fuels, which releases carbon dioxide into the atmosphere. 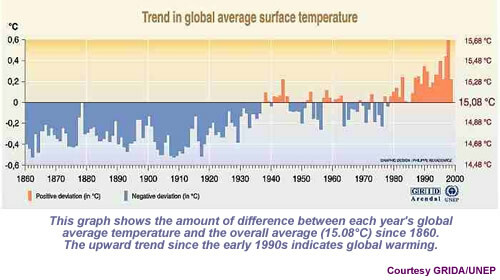 Consequently, in the past one hundred years global temperatures have been increasing more rapidly than the historic record shows. Scientists believe this accelerated heating of the atmosphere is because increasing amounts of these greenhouse gases trap more and more heat. There are many different factors that complicate this system, including clouds, volcanic eruptions, oceans, and people. Additionally, there are likely factors that affect climate which we have yet to identify. Factors interact, resulting in global cooling, global warming, or even contributing to both. Find out more about some of these processes by clicking on the link above.